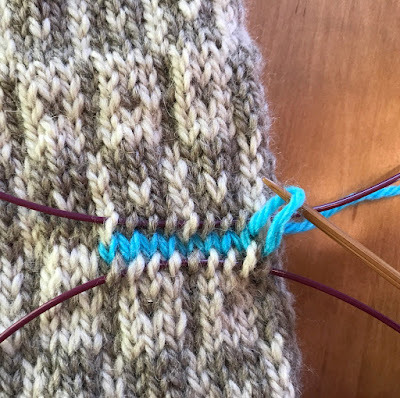 This is Part 2 (of 3) of my mini-tutorial on the afterthought thumb used in making my Multi-Pane Mittens. Part 1 was THE FORETHOUGHT. Before you can knit the thumb of your mitten, you will have to place the thumb stitches on needles, and remove the waste yarn. The Multi-Pane Mitten pattern has step by step instructions with photos. This tutorial will show the process in greater detail. 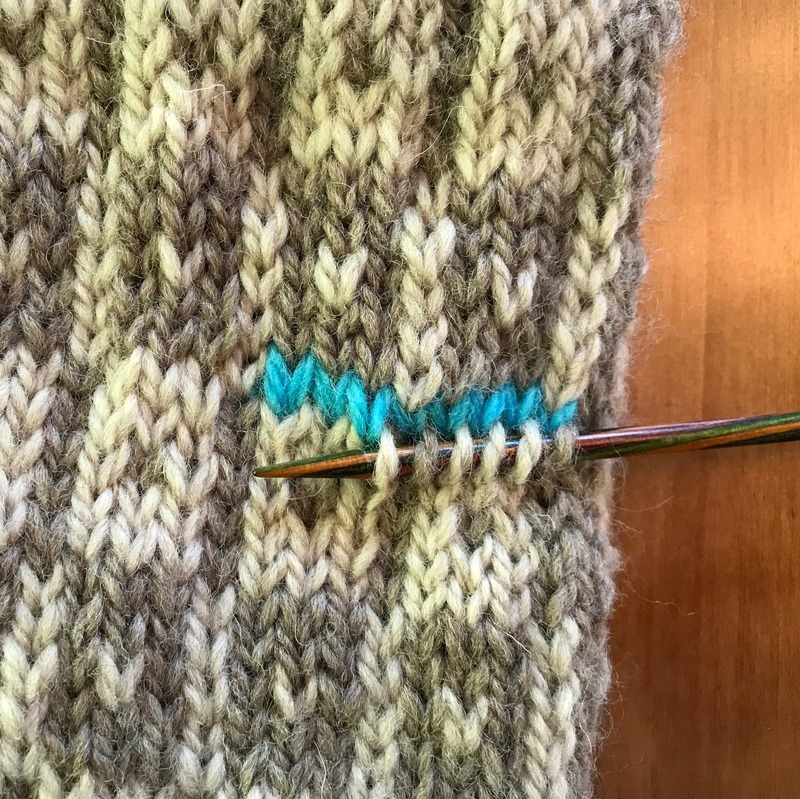 Using two (double pointed or circular) needles, with first needle, from right to left, pick up 9 sts below waste yarn. 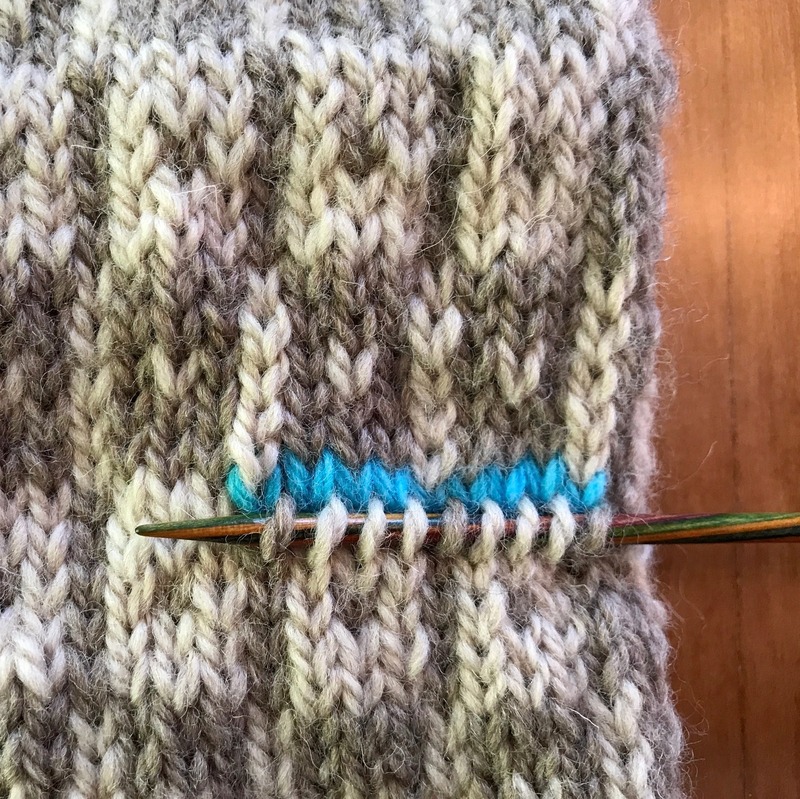 (If you think of each knit stitch as a ‘V’ with a right and a left leg, you will be picking up the right leg of each ‘V’ below the 9 ‘V’s of your waste yarn. This part is rather straightforward. Rotate the mitten 180 degrees. With second needle, in a similar way, pick up 9 sts below waste yarn. 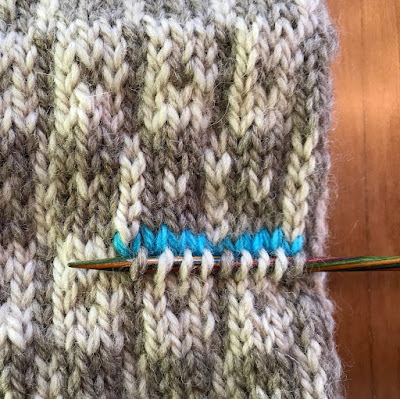 In this position, the stitches you pick up will appear to be a half stitch to the left, and some of the 'V's will be have two different colored legs -- but once again, pick up the right side of each ‘V’ below the ‘V’s of your waste yarn. Hint: Your 9 picked up sts should begin and end with B. 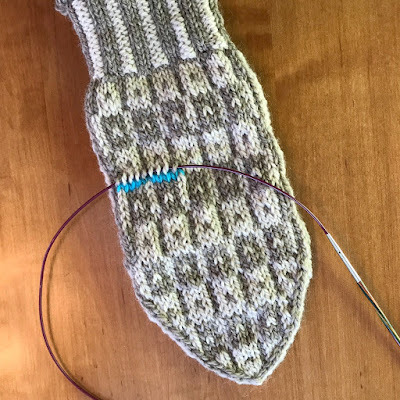 Now your mitten has a thumb hole. Some of the upper 9 stitches will have floats attached. Don't let them scare you. Tuck them into the mitten, and try to ignore them. They really will not be a problem and will stay behind the work after the first round of the thumb is knit. What a lovely thumb hole! My next post is on knitting and finishing the thumb.